Golfers are always looking for a way to gain more distance off the tee. Recent studies have shown that a 90-shooter who increases his drive by 20 yards will effectively lower their score by 1.6 shots per round. So it does pay to hit the ball farther. While many golfers try to buy this increase in distance with the latest driver a more cost effective way may be a simple improvement in their technique. More specifically an improvement in their angle of attack. Below is a chart that measures driving distance of varying swing speeds and different angles of attack (hitting down, swinging level, and hitting up on the ball). 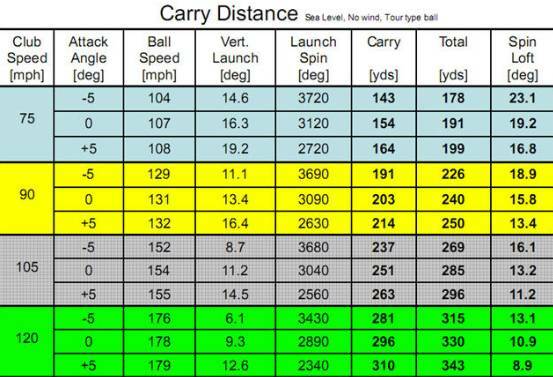 Each speed window shows a substantial increase in carry distance and total distance when hitting up on the ball 5 degrees as opposed to hitting down on the ball 5 degrees. The improvement is approximately a 25 yard gain in distance without adding speed to your swing. Think about that for a second: golfers do not need to swing harder to hit the ball further but simply swing more efficiently. So how do you ensure that you hit up on the ball to gain 25 yards? Many students who come to our Academy do not tee the ball high enough. In most case they are fearful of hitting the dreaded popup drive that leaves a scuff mark on top of their club. To circumvent this fear golfers tee the ball low and strike down on their drives. This negates the chance of popping up the shot but as the chart shows leads to less distance on their drives. Allow the torso to lean away from the target (tilt) at address. Looking into a mirror you should see a noticeable angle to your spine. This will cause some weight to move into your back foot. Avoid letting the hips shuttle or move back with the tilt. Keep the hips centered over the feet. The goal is to create a upward angle with your shoulders, a ramp to help create the upward attack angle. Avoid trying to keep your shoulders level at address. Step 3: Stay back as you swing into the ball. All great drivers of the golf ball increase the amount of spine tilt away from the target as they move into the strike. One of the true deterrents to hitting up on the ball is the idea of weight shift. Momentum is going forward but that does not mean your torso/head should as well. Stay back and increase the spine tilt when hitting a driver. In summary launch monitors have proven that hitting up on the ball will increase your driving distance. By following these 3 simple steps and learning to hit up on the ball you can increase your driving distance and lower your scores.